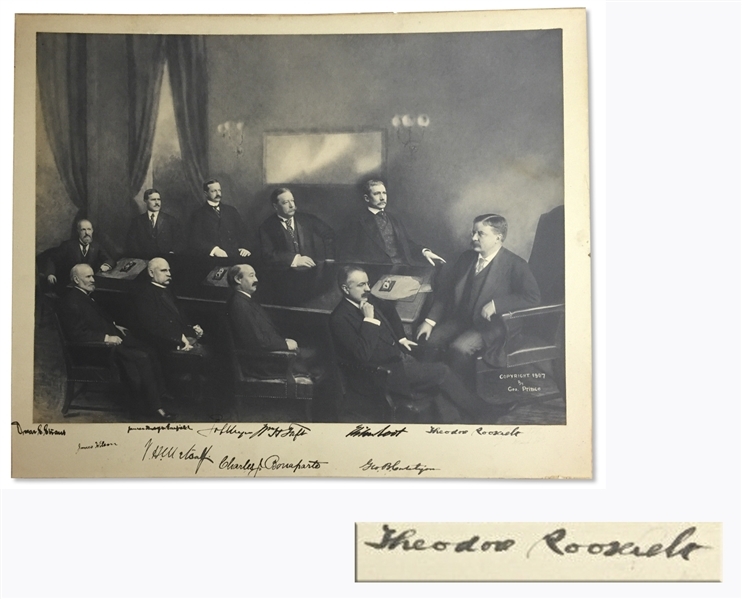 President Theodore Roosevelt signed photo of his cabinet, also signed by the 9 cabinet members, including future President William Taft. 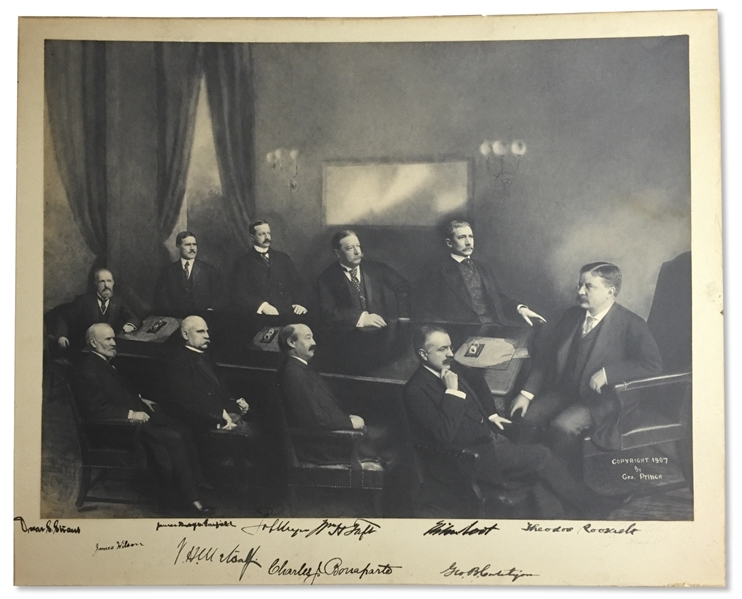 Roosevelt sits at the head of the table, facing his cabinet members, in this gorgeous photo taken by George Prince in 1907. Signatures in fountain pen include President Theodore Roosevelt, and then clockwise Treasury Secretary George B. Cortelyou; Attorney General Charles Joseph Bonaparte; Navy Secretary Victor H. Metcalf; Commerce and Labor Secretary Oscar Straus; Agriculture Secretary James Wilson; Interior Secretary James R. Garfield; Postmaster General George von Lengerke Meyer; War Secretary William H. Taft; and Secretary of State Elihu Root. Photograph is affixed to the signed mat, also signed by George Prince from Washington DC, appearing lightly below Roosevelt's signature. 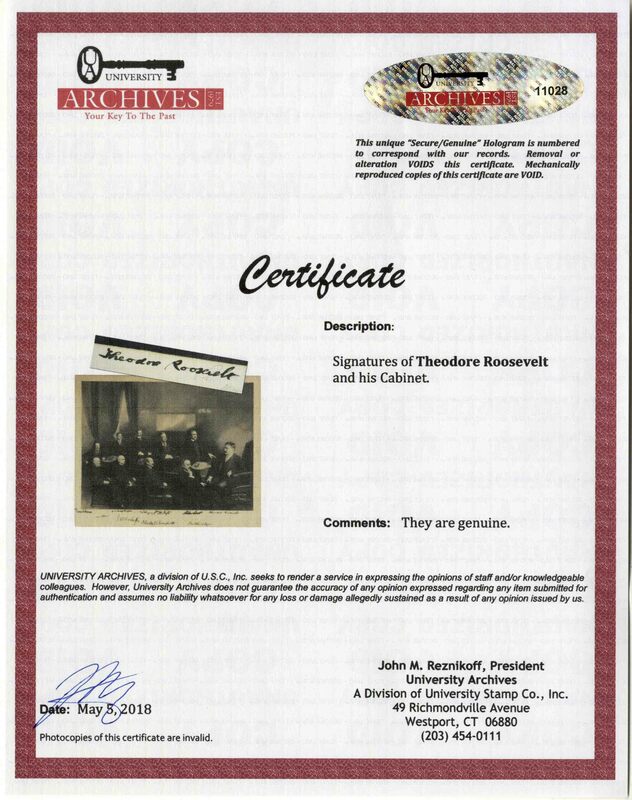 Mild uniform toning to mat and very light discoloration to right margin of photo, overall very good plus condition, a stunning memento from the Theodore Roosevelt administration. With University Archives COA.